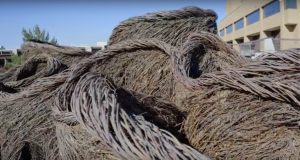 Guest Artist Patrick Dougherty spent three weeks this summer on the Utah State University campus creating a sculpture from 30,000 pounds of willow branches. With the help of his son Sam and several USU volunteers, the North Carolina native’s unusual sculpture sits just east of the Merrill-Cazier Library. As he worked at USU, Dougherty said he appreciated hearing how the sculpture affected viewers watching it being built. The structure, which he named “A Restless Spell”, is similar to others he has created all across the country. It will be on the USU campus for approximately two years. 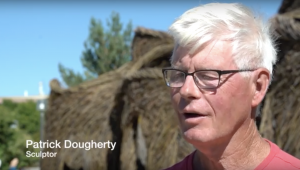 See Patrick Dougherty explain the structure on the USU campus. USU has also produced a time-lapse video of the sculpture’s creation.